Amber Rudd has suggested the Westminster sexual harassment scandal could lead to greater powers for MPs to be sacked - but denied the Government might collapse amid allegations against senior ministers. 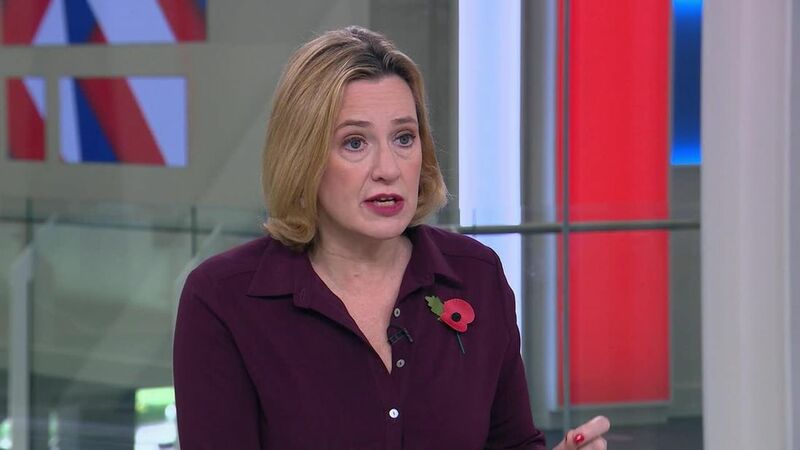 The Home Secretary said she supported a fresh look at how MPs are kicked out of the House of Commons as part of the response to the scandal.It follows numerous reports of abuse or inappropriate behaviour at Parliament.Speaking to Sky News' Sunday with Niall Paterson, Ms Rudd said: "That is one of the things that I would encourage the review to look at. "It may be the case, it may not. It is wrong for us to have a knee-jerk reaction based on the past week. "I think what we need to do is look at the whole issue. There needs to be a procedure put in place as soon as possible. "But the consequences of misbehaviour, of the sort we've been looking at this week, there needs to be a proper look at what action needs to be taken after that. "Under legislation that came into force in 2016, following campaigns in the wake of the expenses scandal, MPs can be forced to vacate their seat, sparking a by-election, if at least 10% of the electorate in their constituency signs a recall petition. But MPs are only subject to such a petition if they are convicted of a criminal offence for which they receive a prison sentence; are barred from the House of Commons for 10 sitting days or 14 calendar days; or convicted of making false or misleading expenses claims. Also, if an MP is pushed out of Parliament by a successful petition, they are entitled to stand in the subsequent by-election.Three Tory MPs are currently being investigated by the party's new disciplinary panel set up in the wake of the Westminster scandal.Ms Rudd said she had "no knowledge" of reports the Prime Minister has put Conservative officials on notice to be ready to launch by-election campaigns at any time.A party source told The Sun: "The events of the past week have taken us deep into uncharted territory. "We have been told to leave nothing to chance and have drawn up a whole raft of contingency plans. "Ms Rudd insisted ministers are "getting on with the important issue of government" and "delivering on our agenda", as well as dealing with the fallout from the deepening scandal.She has also stressed the Government is "absolutely not" on the brink of collapse as a result of the widespread allegations against politicians from all parties, which has also included Theresa May's deputy Damian Green and Sir Michael Fallon, who quit as defence secretary last week.